This is not my own design. 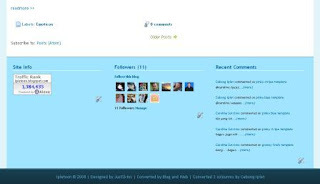 This Curved Templates designed by Just Skin and converted to bloggger by Francisco . The original template is two column only have one sidebar at the right. And then I convert it to 3 columns so I just add one sidebar beside the old one. I really love that baby blue template, so cute, calm. There's no many detail really simple suitable for personal blog. If you wanna see the original source please go to eblogtemplates.com. Makasih mba, read morenya udah bisa. Tadi aku buka trus tidak di centang "Expand Wodget"-nya trs save. Setelah itu aku tambahin kode readmore nya, sekarang udah bisa. he...he... Makasih ya?